Members of the Khelafat Majlis party attended a protest against the recent attacks on the Rohingyas in Arakan in Myanmar, in Dhaka, Bangladesh, Tuesday. The broad estuary of the Naf River separates Bangladesh and Myanmar. On both sides of the Naf, armed forces have amassed of late. The countries aren’t at war — against each other at least. Rather, the soldiers are on the lookout for members of the Rohingya ethnic group. 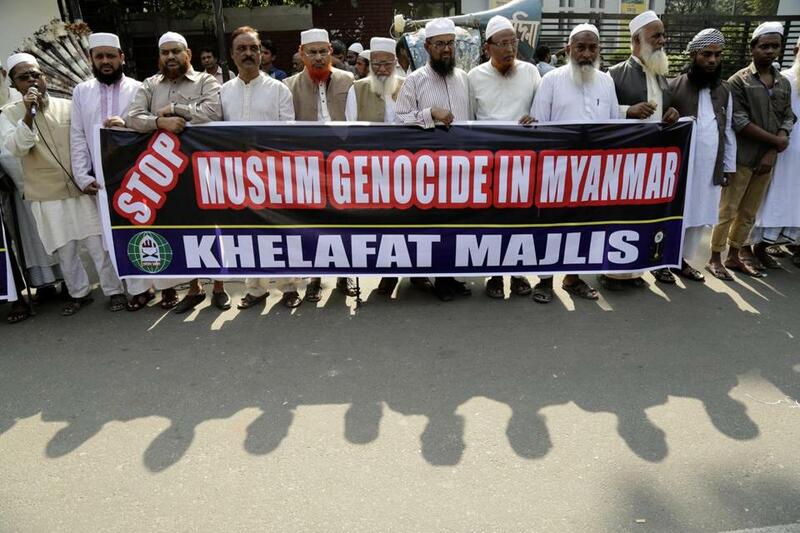 Myanmar wants them out. Bangladesh wants them to turn around and go back. On Wednesday alone, Bangladeshi police said more than 500 Rohingya made a desperate voyage across the Naf, adding to the thousands who have crossed in recent days. For the past month, human rights groups have documented the burning of entire Rohingya villages by Myanmar’s military. But the Bangladeshis, who for the most part share the Bengali language and Muslim faith with the Rohingya, say they have no room for refugees. ‘‘We nabbed them after they illegally trespassed [into Bangladesh]. They will be pushed back’’ to Myanmar, local police chief Shyamol Kumar Nath told Agence France-Presse. Fleeing Rohingya who have spoken with reporters and human rights activists recounted killings and rapes in their villages. They fear suffering the same fate if Bangladesh forces them to make the return journey. The news agency Reuters reported that escalating violence has killed scores and displaced about 30,000 in recent weeks. The violence seems to have been triggered by an attack Oct. 9 against Burmese border police that killed nine. Police blamed Rohingya militants — accusing them of ties to radical Islam — and began a scorched-earth campaign. The roots of anti-Rohingya sentiment go back decades, if not centuries, in Myanmar, a majority-Buddhist nation also known as Burma. Rohingya are denied citizenship in Myanmar. Myanmar’s de facto head of state, Nobel laureate Aung San Suu Kyi, has expressed concern about the fate of the Rohingya but has also accused them of causing the violence. Suu Kyi has had to balance her record of human rights activism with a growing tide of Buddhist nationalism that has emboldened the military, which ruled the country for decades before her. Since communal violence between ethnic Burmese and Rohingya in 2012, more than 32,000 Rohingya have legally registered as refugees at camps in Bangladesh. According to the AFP, many of those who have fled in recent days are hiding out in those camps, hoping to blend in. Thousands more are waiting to cross the Naf into Bangladesh.